May. The month of blooming. The month of Mother’s Day. The month of warm weather (I have been saying this for like three months, so please let it finally be true). And it’s been filled with gaming, as always. Jo Fu and I chatted about Tower Defense Games. We revisited Legend of Zelda: Link’s Awakening with Eve Golden Woods. Steam almost had us paying for mods. Wendy is playing us through The Witcher. A time-looping adventure game is being Kickstarted. And, as always, Brenda is keeping us up to date with the latest gaming news. So, what have we (and you) been playing during this busy month? Jo Fu is keeping the beat alive with Love Live! Forgive me, but this month I have barely been able to look up from a rhythm game about Japanese high schoolers forming a pop music idol club. The available J-pop tracks have been looping endlessly in my head, and I monitor the in-game clock obsessively, waiting to accumulate more points to play new songs, generate new characters, and idolize them into infantile pop stars of a particular Japanese mode. For a girl who spent a whole two months cussing and sniping foes while space-jumping in low-gravity, this is a strange and unusual feeling. Then again, Japanese rhythm games are part of my pedigree as a gamer. Dance Dance Revolution, of course. But also the perfect Nintendo DS game Osu! Tatakae! Ouendan! and its spiritual western port, Elite Beat Agents, where you played as a dance cop and had to defend the world from aliens with your dance skills. With songs like Ashlee Simpson’s “La La” and a riotous final boss to “Jumpin’ Jack Flash,” Elite Beat Agents cultivated an obsession in me that rested for years, unsated, until Love Live! came into my life. The gameplay is simple: as the music plays, circles line up with your team of nine girls, who are placed in a semicircle on the screen. You either tap or hold notes, to the rhythm of an upbeat j-pop song. That’s it! But Love Live! features a visual novel-style storyline (that’s largely inconsequential, and, more importantly, an involved metagame where you “practice” your girls to level them up, “idolize” them to give them special skills, and collect a perfect team of adorable idols). I am obsessed with this game, and I thank its designers for making gameplay dependent on LP, a mode of currency that drains when you play and accumulates over real-world time. If this mechanism didn’t exist, I would probably be jobless, hollow-eyed, and strung out on the power of Japanese idols. I was supposed to be playing The Witcher 2 so that I could write my next diary. I was supposed to play the next episode of Life is Strange. Or maybe finish up that playthrough of Valkyria Chronicles. Instead, I’m running around Tyria once again, preparing for Guild Wars 2’s long awaited expansion. Since quitting my first and most loved MMO, Final Fantasy XI, I haven’t been able to settle on any one game. I am certain that nothing will ever replace that bittersweet experience, and I don’t expect anything to. But right now, three MMOs rest on my gaming laptop, patiently waiting for me to fire them up, wait for them to update, then jump back in to see what’s new. Of the three—DC Universe Online, Star Wars: The Old Republic, and Guilds Wars 2—the latter remains at the top of my list. It’s easy to get back into, even when its story and world changes so much in my absence. The nature of the game is based around community, where everyone plays and works together (save for specific player versus player environments). Removing that competitive aspect from the main world makes for such a pleasant game. The new expansion is offering some significant upgrades to current classes (Reaper, for my necromancer, Penn Stassi) and new story—although the old story has been consistently evolving since the game’s launch. I am a few seasons behind on what’s been going on and keep meaning to catch up, but usually I just end up wandering around, exploring and working on the designated daily activities. It’s not really the “purposeful gaming” it should be for me, considering I have so many other games I want to get through, but sometimes, it’s nice to just relax and game aimlessly. And also play around with my various costumes. I have texts to answer, but I’m looking at my first cats. Like Wendy, I have games I should be playing. And I was! I was playing the game I need to play, and I was writing up my gaming diaries. I was so on track! So in control. And then Twitter showed me a whole new world. Now my life is waiting for cats. This game is in Japanese, a language I cannot read at all, even a little. 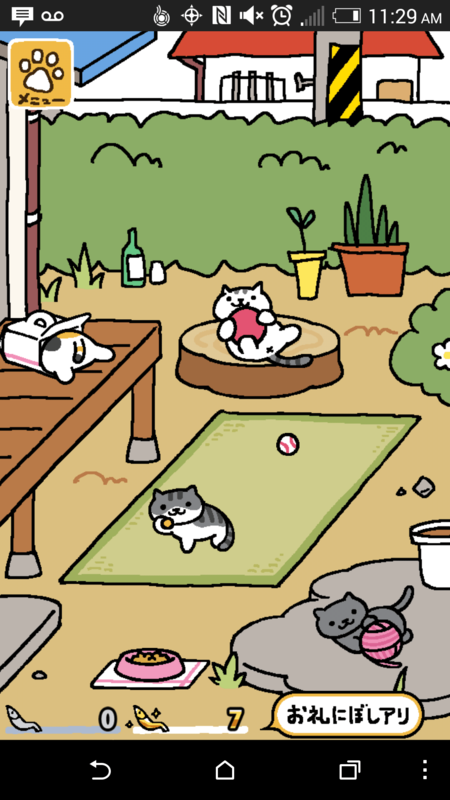 The premise is this: you put food and toys in the garden and the cats will come. Then you look at them and they are recorded in your cat book. You can take pictures of them to put in said book. And you can rename them (my names are just gems; “Turdlet” and “Bangs” are two good examples). That is basically it. I’m late to the Mass Effect series. I’ve been a fan of Dragon Age, another series BioWare develops, but it wasn’t until earlier this year I played the first Mass Effect. While I didn’t find that one amazing, for the last five years I’ve heard everyone gush about the second game. There’s a noticeable improvement from Mass Effect to Mass Effect 2, and I’m not talking solely about the graphics. The sequel builds on the history players learn in the previous game while providing great characterization of the characters who can join the mission to stop the latest threat against the galaxy. For example, in the first game players learn from Wrex, a krogan on the team, about the genophage, which has severely limited krogan population growth. In the second game, one of the squad members is a scientist who worked on a strengthened genophage when the krogans began to overcome the sterility plague. Through this mission, the player can have in-depth conversations about scientific ethics and morality. In the first game, I believed the genophage was disgusting and could lead to genocide. While I still disapprove of it, I have a more nuanced view on it. Mass Effect 2 felt like it flew by in a flash, even though I played about thirty-five hours of it. I was significantly more invested in these character side-quests than the main story. After coming back from the dead, Commander Shepard finds herself tentatively allied with Cerberus, a pro-human organization with some sketchy ethics from what players learn in the first game. The first third of the game involves recruiting squad members both new and old. Reuniting with characters, like Garrus and Tali, is touching, and the new characters are a delight as well. It’s also great to see a woman and a black man—both with interesting side missions—as the human squad members! Diversity in science-fiction that shows us white humans and then different alien races isn’t actually diverse. My main complaint is how anti-climactic the final mission, dubbed the “suicide mission” in-game, feels. While the combat is straightforward, delegating tasks to squad members has dire consequences. When one of my teammates died, I learned squad members who were not loyal to me were more likely to die in this mission. Turns out this person was loyal, and yet, if certain squad members were my secondary team, this loyal squad member could still die. It’s all complicated behind the scenes, and I had to look through old forum discussions even to begin to understand where I went wrong. Beyond that confusion, the final fight never felt like I was making any big decisions, and it was certainly nowhere near as interesting as debating morality and the ethics of limiting a race’s fertility rates! 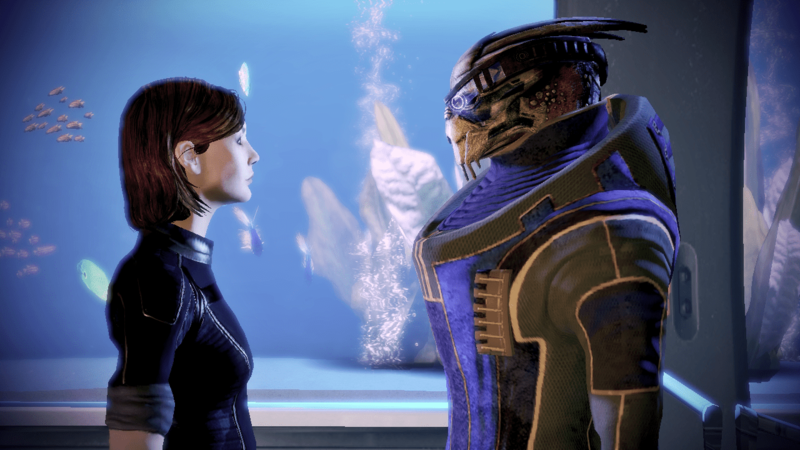 But I did get to romance my lovable dork, Garrus, and that’s all I’ve wanted since the first game. Wendy, I’ve also been playing some Guild Wars 2 lately. I finally got my norn ranger to level 80, although I mostly play my level 80 human warrior. We should play together sometime! And Carly, I’m the same as you. I only just finished playing Mass Effect, Mass Effect 2, and Mass Effect 3 this past winter. I love BioWare, but for some reason, I never got a chance to play ME until recently. I got into Dragon Age about two years ago, but it was the Star Wars: Knights of the Old Republic games that initially got me into BioWare many, many years ago. Carly, that suicide mission was… interesting…. First of all, I didn’t like that it wasn’t a suicide mission since you could fairly easily figure out how to have a perfect game by making the right choices. I am loving the Witcher right now because your choices really do have consequences that you can’t “fix” the way you can in ME. I suspect you had the same issue I did with losing a character. I very purposely did not have everyone loyal for my ME2 playthrough because there were certain people I did not agree with. She and I eventually had a reconciliation later, but it was bittersweet, as was dealing with the consequences of the death in my suicide mission. I felt that it made for a more rewarding story to have to deal with those consequences in my legacy playthrough. Rine, that’s my necromancer, whom gets most of my attention in terms of good gear etc, but I also have an 80 Norn ranger, Sylvari warrior, and Norn elementalist. as well as a 36 Asuran engineer. I will one day make a Charr when they offer me new classes.